In today's high-tech world, all companies are striving to create business value from digital data, but the real value in data comes from how it is used to make decisions. At the end of the day, what drives the results your company achieves is the millions of decisions made every day that are influenced by customer interactions and transactions. In this groundbreaking book, Larry Rosenberger and John Nash draw on over fifty years of experience in helping companies automate, improve, and connect decisions. Using analytic techniques first pioneered by Fair Isaac Corporation, the authors clearly show how today's forward-thinking executives and managers are using analytic insights to ensure their decisions keep up with information complexity and the pace of change—especially changes in consumer behavior and attitudes, in regulations, and in competitive actions and reactions. The authors explain how making better decisions through a combination of data, mathematics, and software can lead to a more customer-centric, cost-competitive, and creative organization.?? Highly accessible, The Deciding Factor helps demystify the math and information technology behind decision management for the business manager who may not be a mathematics or computer science wizard. As practical as it is approachable, the book answers such questions as: How does a multinational consumer packaged-goods company build brand loyalty one person at a time? How does a consumer credit-card company process millions of transactions every second and keep fraud under control? How can a big-box retailer increase per-customer profitability? 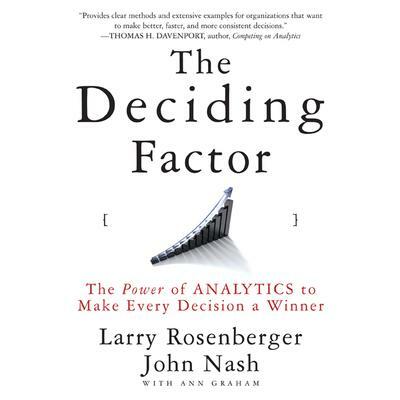 Rosenberger and Nash offer a much-needed resource for decision makers from the boardroom to the front line, a resource that provides guidance to create and unlock new sources of value from an organization's decisions.